Kurt Ernst January 9, 2012 Comment Now! While compact SUVs are nothing new, compact luxury SUVs with 314 horsepower and a distinctly sporting feel aren’t exactly commonplace. 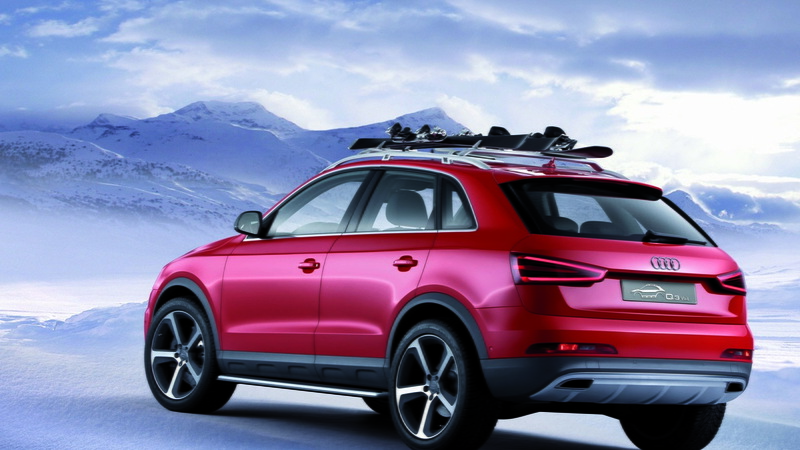 Audi is targeting “young fans of winter sports who love skiing or snowboarding” with it’s latest concept, the Q3 Vail, and we’re betting that it may be on to something. 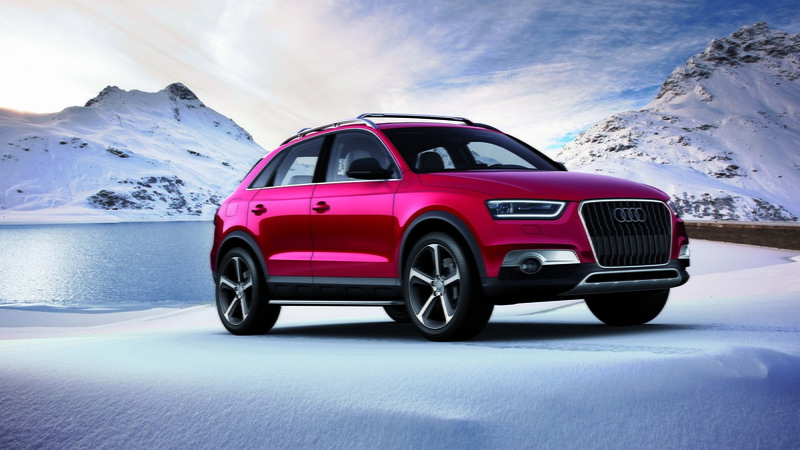 Starting with the new Audi Q3 (coming to U.S. dealers this spring), the Q3 Vail concept gets a unique “Energy Red” paint job, which includes golden pearlescent highlights. This is offset by matte gray trim panels in the front and rear, as well as matte gray fender flares and side skirts. The flared fenders, vertical strut grille, lower front air intake and aluminum underbody guard are all meant to convey a sense of strength, but with a dash of sport thrown in. The Q3 Vail may not be built to tackle the Rubicon Trail, but it will get there a whole lot quicker on paved roads than a Jeep Wrangler. 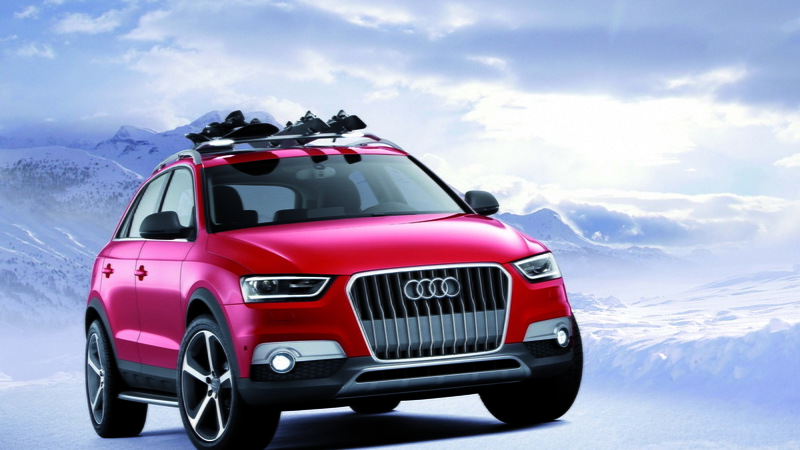 As you’d expect from a vehicle focused on winter sports, the Q3 Vail gets a custom roof rack designed for carrying skis and snowboards. The roof rail support contains integrated LED lighting to illuminate the area around the SUV, and these lights are controlled via a switch in the roof module. Inside, passengers get a blend of luxury (like the Nappa leather-wrapped dash and center tunnel) and practicality (like the charging station for flashlights or the heated Thermos bottle). A heated, folding trunk mat ensure that you’ll have a warm place to sit as you change from ski boots back into driving shoes. Power comes a turbocharged 2.5-liter five cylinder TFSI engine rated at 314 horsepower and 295 pound-feet of torque. 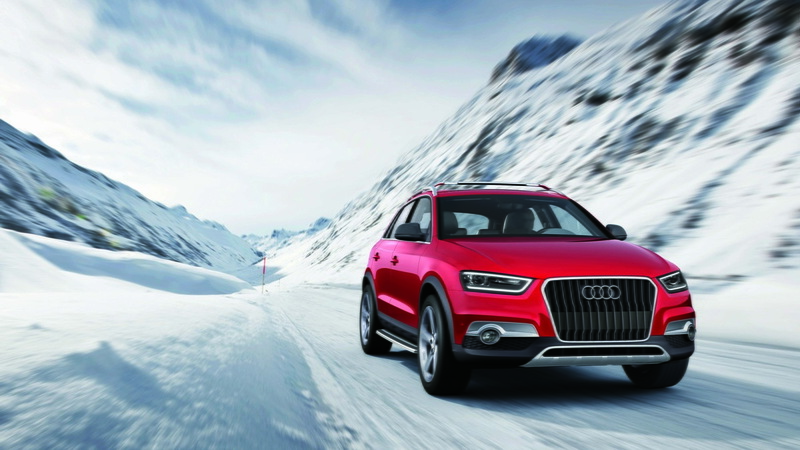 In the Q3 Vail, this gets mated to a seven-speed S tronic transmission, which sends power to the Vail’s quattro all-wheel-drive system. Audi claims a zero to 100 km/h (62 mph) time of just 5.5 seconds, coupled with a top speed of nearly 163 miles per hour. Even those of us living in climates that don’t get snow know that those numbers add up to big fun, regardless of weather. 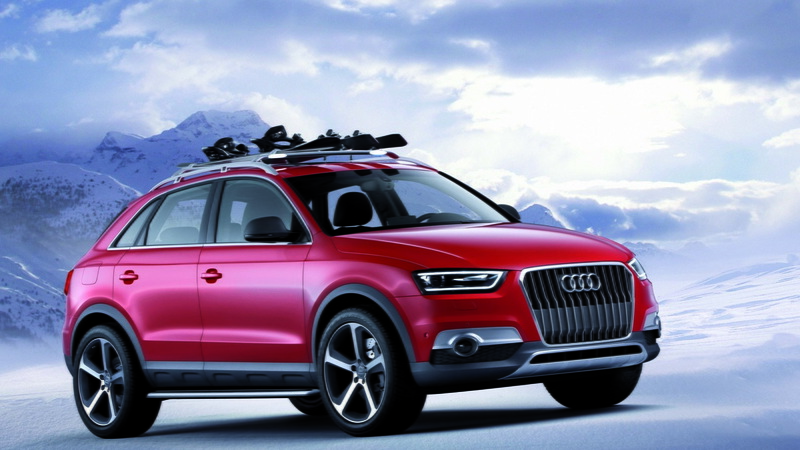 Audi isn’t saying if the Q3 Vail will see production, but its regular Q3 SUV will begin hitting U.S. Audi dealers this spring. Want to see what else is debuting at this week’s Detroit Auto Show? You’ll find our complete coverage of the event here.